Cost of hiring in the United States is around $5000 to $10000 for a single candidate, which includes time invested in searching for candidates and screening them. For every professional who is hired, the company must also bear overhead expenses of equipment, office infrastructure, paid leaves, insurance, federal and state income taxes, etc. 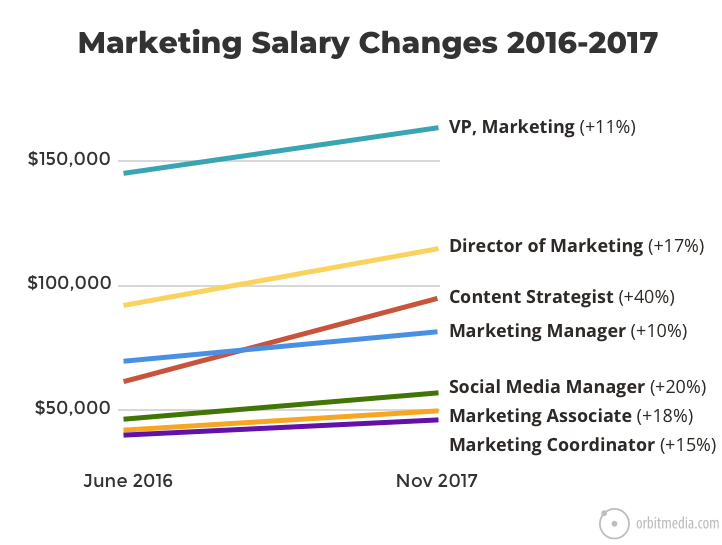 in addition to the salary. 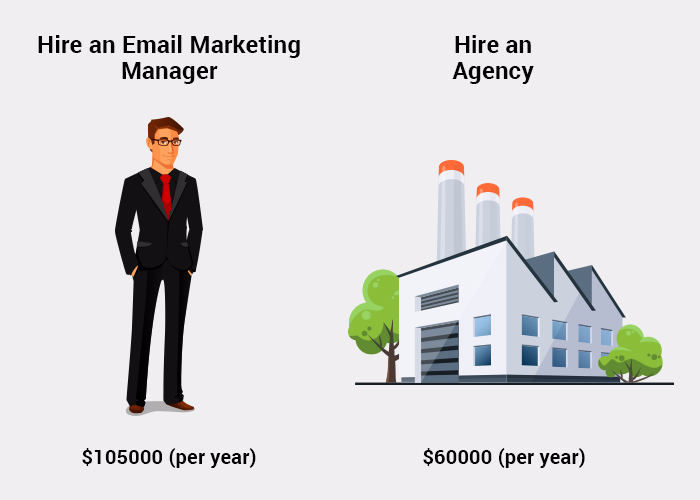 As far as email marketing managers are concerned, the total cost of hiring them is around $105000 that is around 1.4 times their annual salary of $75000. Monthly cost according to these calculations will be around $8750. Besides, if the professional is not competent enough, it will cost you $25000 to $40000. Based on the studies by the Society for Human Resource Management, whenever a salaried professional is replaced, it consumes an average of 6-9 months of salary. According to a few other studies, losing a salaried employee can cost as much as twice the annual salary, which is particularly applicable for a high-earner or executive-level professional. Outsourcing, on the other hand, costs you an average of $5000 per month, that comes down to an expenditure of $60000 annually. These facts contradict the notion that outsourcing is more expensive than hiring an employee. Running a successful business is not just about making profits. It is also about cutting down the expenses. That said, when compared to hiring an employee, your yearly saving is around $45000 if you choose to outsource. Doesn’t that sound awesome? Whenever you outsource to an email marketing agency, you eliminate the efforts and resources taken to train the employee. Experts at an agency understand their tasks pretty well and deliver the best services after proactive consideration of your requirements. Often, it is seen that an employee does not have sufficient knowledge in the nitty-gritty of email marketing. In such cases, outsourcing is a cost-effective and easy solution that helps you meet all your business needs. An email marketing agency works as a catalyst for your business growth. While the agency manages your email campaigns, business owners can focus on the core business processes instead of the supporting tasks. As a result, they will have better flexibility in managing operations and manpower. Quite often, the marketing team is stuck in a tunnel vision, deprived of technical know-how. Outsourcing to a new team gives you a fresh perspective and helps you reinvent new opportunities. An agency is familiar with the latest email marketing tricks and techniques that are working in the industry. Therefore, you get to know about novel approaches and try something different from the outdated practices. Experts at an email marketing agency help you in the implementation of an effective email marketing strategy by adhering to the best practices. Whether it is about building a quality subscriber list or enhancing the email metrics, an agency looks after all such aspects. An agency will come up with creative ideas for opt-in offers, lead generation resources like whitepapers or ebooks, and exciting offers and contests for social media, that will help you grow your subscriber list. An agency can design relevant emails considering the behavior, preferences, and interests of the subscribers. They assist a business in driving a tangible ROI from the campaign. As they have access to email metrics, they can carry out a detailed analysis of every email campaign and determine which campaigns connected the most to the subscribers and which did not. The agency assesses the subscriber information and purchases history to set up revenue generating automation campaigns. It becomes easier to expand and scale your email marketing program with the help of a team. Outsourcing to an agency also eliminates the concerns about people quitting the job, taking sick leaves or going on a vacation. Once you have outsourced to an agency, your job will be done, no matter what. The time zone difference. Rendering is a crucial aspect of email campaigns. As the emails are built by email marketing experts, you can be sure about flawless rendering, impeccable coding, and optimized design. The team also makes sure that your campaigns are created timely and deployed according to the schedule. If you are looking for efficiency and perfection in your email marketing strategy, outsourcing is the safest bet for you. You can trust an email marketing agency for all the services it provides and confides in the expert advice that they have to offer all along the way. Even when you are on a vacation, you can rest assured that your email marketing will be taken care of. Moreover, if you have seasonal tasks or temporary needs, outsourcing is the best option for you. Your email marketing needs to achieve the business objectives and bring you a consistently increasing ROI. An agency is committed to delivering the best results by constantly optimizing the strategy without any risk of stagnation or complacency. Usually, the in-house employees are so occupied with routine activities that they can hardly keep up with the latest advancements in the field. As a result, the scope to grow, change, and evolve is almost nil. An agency, on the other hand, gives education equal importance and stay abreast with advanced tools, trends, software programs, and strategies. They invest enough time in learning the use of new resources without any additional charges. In this way, you get to learn new stuff without any learning curve. Before you make up your mind on whether to outsource or hire in-house professionals, consider the tasks that need to be done and figure out your cost metrics and “True Employment Cost” or TEC. Take the decision only after weighing down the pros and cons of hiring and outsourcing. Ultimately, your decision should be able to drive the maximum competitive advantage for your business.